The Fontana Village was a little taste of comfort before entering the Smokies. This area is focused on the attractions associated with the Smokies and the Fontana Dam. The weather was rather cold the last couple of weeks and the locals had a term for this. They called it a Blackberry Winter, meaning that it was still cold when the blackberry bushes were starting to bloom. The week prior there had been reports of snow in the Smokies. The Great Smoky Mountains National Park southern boundary begins at the 167.1 mile point on the North Bound Appalachian Trail. The trail traverses approximately 70 miles through the Smokies, and contains he highest peak for the entire AT. That peak is Clingmans Dome at a height of 6,667 ft. There are shelters within the Smokies, and only one of the nights did I sleep in my tent. The other nights I slept in the shelters which had both positive and negative aspects. The positive was that you typically had a level surface to sleep on, and you did not have to deal with setting up or breaking down your tent. This meant that you could get an early start the next day. The negative side of sleeping in the shelter was that some folks didn’t go to sleep until later in the evening, and others got up at pre-dawn hours to hike before daylight, which had a tendency to disrupt the entire group’s (put to 12-14 people) sleep. The tent camping offers private space and a more restful sleep. I hiked through the Smokies with only one resupply at Gatlinburg, TN. There was one day where it was overcast, misty, and cold. Thank goodness that I had dry thermals, my Western Mountaineering 30deg. sleeping bag, and my Thermarest sleeping pad to keep me warm through the night. Having a good sleeping system and warm base layers are essential when the temperature drops suddenly in the mountains. 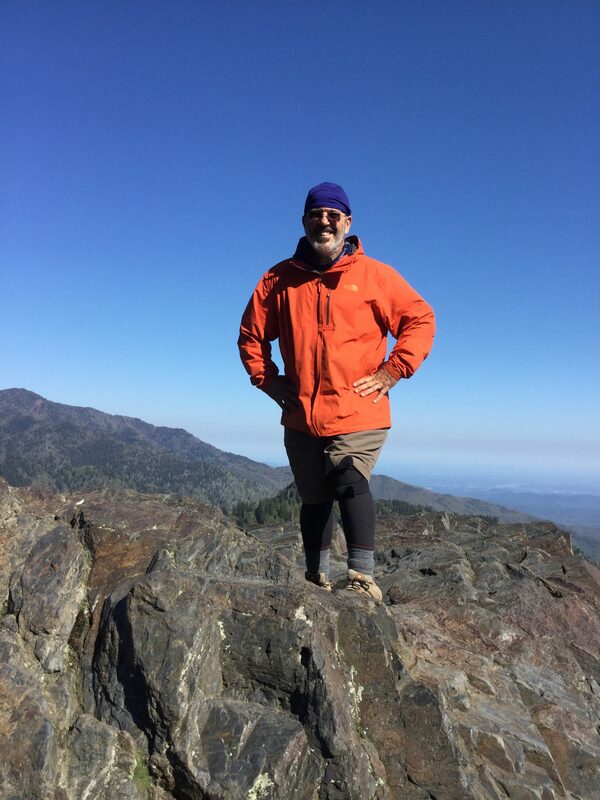 The Northern Boundary of the Great Smoky National Park occurs at Davenport Gap at the 236.7 mile marker on the AT. It was good to hike through the Smokies and see the unspoiled beauty of our national park. All throughout the Smokies the AT threads the TN/NC statelines. The Park was well maintained, and offered many opportunities to experience nature. The Smokies are available to section hikers as well, offering different trails with car parking at trail heads. 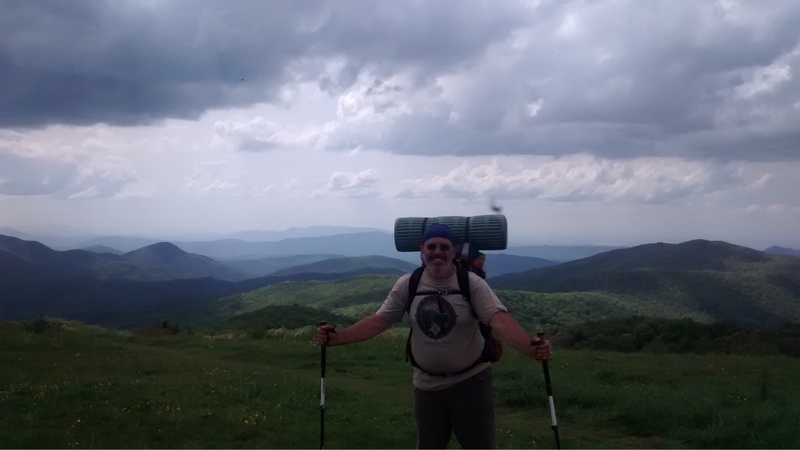 I think that one of the most spectacular panoramic view of the mountains was at Max Patch at the 253.6 mile point on the AT. The beauty of this place can’t be captured in words or a photograph, and is accessible by a dirt road and a short walk for non-hikers. One of the flowers along the trail. Way to go Tom!!! Just read your post to Miss Kay who is finally HOME!!! 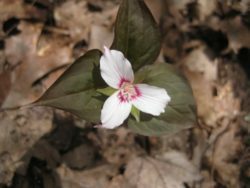 She is identifying your trail flower as a trillium (she thinks). 🙂 Hope to maybe see you when you hit the MD/PA boarder. Glad to hear that you’re still making progress on your journey to Maine. I’ll be in Ocean City, Md. in about two weeks. Looking up the progress on the new homesite during that time. Much success on your trek . Great job, Tom. Best of success as you journey north. Tom, you are doing an amazing job ! I enjoy reading your posts and seeing where you are. Take care and stay safe! Way to go Tom. Keep us posted on your adventures. Amazing the challenges you undertake in all bounds of life and fully embrace the situation. Great blogs and feels like we are experiencing with you but without all the sore feet ! Keep it going ! Herb. Love your trail name. It’s very fitting for you! The flower is a painted trillium.